Last week Coy Bacon passed away. 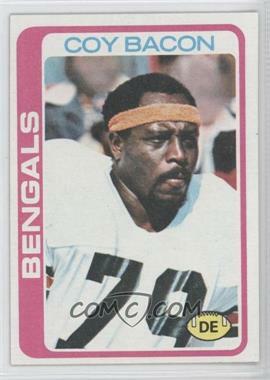 Coy was selected to three Pro Bowls during his 14-year career as a defensive lineman in the NFL and traveled as a motivational speaker. You can learn more about Coy on Wikipedia. A longtime friend of Coy’s let me know today that he was able to purchase a couple of Coy’s cards on Christmas day. We shipped the cards on Friday, and they arrived in Ohio today. They were just in time for the visitation, and one of the cards was given to Coy’s granddaughter who was very appreciative. It is encouraging to hear that our service is being used to help spread some joy. Our prayers go out to the Bacon family.